Myopia is the medical term used to describe shortsightedness and emmetropia (from the Greek meaning well-proportioned) is the term used to describe perfect eyesight. Hyperopia is the term used to describe longsightedness and it is as a hypermetrope that we are all born. The eye then undergoes a process called emmetropisation where we become progressively more short-sighted with the goal of emmetropia in mind. Unfortunately, in some cases, the eye does not stop at emmetropia but continues and becomes more and more short-sighted, this is thought to be the case in approximately 35% of the population. We do not fully understand the risk factors of triggers involved in the progression of myopia but we do know that heredity and excessive reading/close work do have a role to play. We know that the higher level of education (ie the more close study work done) then the greater the risk of being shortsighted. Current thinking centres on the axial growth of the eyeball which is stimulated by peripheral defocus. When the eye does not completely focus ALL of the light hitting the retina, particularly the edges of the vision, then the brain tries to correct for this and stimulates the eye to grow more in an attempt to bring the whole image into focus. This is particularly apparent when reading; thus the more reading done the greater the risk of myopia. 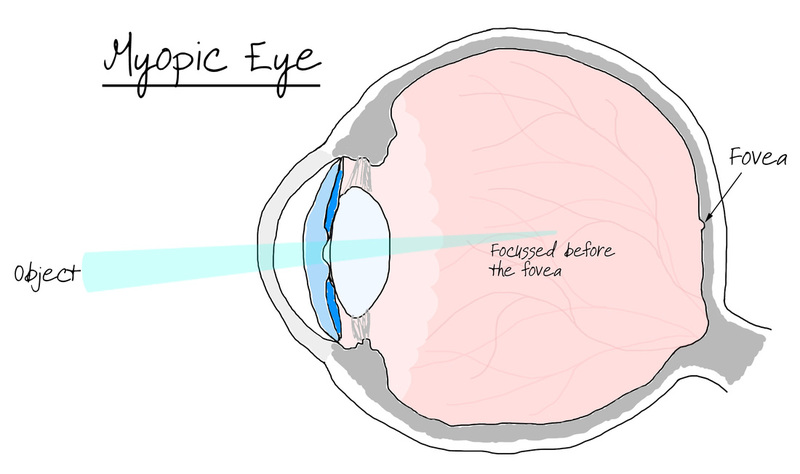 If the eyeball is too long the light will be focused before the retina, and therefore, will not be focused properly resulting in short-sightedness, myopia. Recent research at Kings College London states that a gene has been isolated that determines whether a person could be shortsighted. This proves a heredity link but also could pave the way for gene therapy in the future. It is well known that undercorrection of myopia (ie do not wear glasses or glasses are not strong enough) has a negative affect on the progression of myopia. That is to say if you are slightly short-sighted and do not wear your glasses or haven't had them checked in a while so that they are not powerful enough, then you are more likely to become more short-sighted. This is not the whole story, however, as wearing the correct spectacles only has a small affect on the rate of progression. Over the years there have been many theories postulated in an attempt to slow the progression of short-sightedness. Here are some of the more efficacious treatments available. Drugs - Antimuscarinic drugs have been used very effectivley to reduce the progression of myopia. Atropine (isolated from deadly nightshade) or similar eyedrops are used to temporarily paralyse the eyes focusing ability. This method can be very effective, however, it also needs to be monitored in a hospital setting as the medication is extremely toxic. It, therefore, is not routinely used to treat children. Bifocal glasses - since the greatest affect of image blur causing eyeball growth occurs when reading it is thought that relaxing the eyes own focusing mechanisms and using a bifocal lens to create a more accurately focused image on the retina can remove the growth stimulus. Some studies have shown a 20% reduction in the myopia progression when using bifocal lenses. Varifocal glasses - Work on the same principle as bifocal lenses with the added advantage of better cosmesis. The lenses do not have a visible line on the lens. Studies have shown, however, that they are not as efficacious as bifocals and this may be due to the peripheral defocus inherent in all varifocal lenses. RGP Contact lenses - Rigid Gas permeable contact lenses have shown some promise in some studies and this is thought to be due to the superior image quality produced by the contact lens. On the whole though, RGP lenses are not thought to significantly reduce the rate of progression above standard glasses lenses. Soft multifocal contact lenses - this is currently the area of greatest research with coopervision launching their "misight" lens in Asia and other lens companies researching alternatives we are likely to see a host of options in the future. The theory behind these lenses is that the design allows for different focal points at different eccentricities of the lens. This means that the focus power changes the further out from the centre of the lens. Because the light is though to be incorrectly focussed in the periphery *(see image above) this seems to be an ideal solution to the problem. In fact studies have shown that myopia progression can be slowed in 30% or more using these lenses. More research is needed, however, as different lens designs could provide different results, but it is a very promising modality. Orthokeratology - Overnight vision correction is the most promising form of myopia control at present and is currently used regularly in Asia. Many studies are underway to assess how effective this modality is but recent published results show that the treatment reduces the risk of progression by over a half. It is though that due tot he corneal re-modelling (see ortho-k page for more information into how it works) the image is more effectively focused on the retina and, therefore, reduces the amount of myopic progression. OrthoK is our first choice method of myopia control due to it's ease of use and advantage of no corrective lenses being worn throughout the day.